Just how flexible is an Operation that is organized in Super7 teams? 40%. Super7 Operations can cope with a difference of 40% between a quiet day and a busy day. From the many examples in day-to-day operations, we know that Super7 Operations increases the flexibility of a back-office. Impressive results have been achieved with this over the past few years, in many operational departments of large financial service providers. Examples of this can be found in my book: Super7 Operations – the Next Step for Lean in Financial Services. Recently, one of my clients asked me to calculate just how flexible a team will become. How much can the daily demand fluctuate when working with no customer queue when the team works as a Super7? An alternative could be replacing a part of the employees with flexible contractors: so called min-max-contractors, who work between 20 and 40 hours per week depending on demand. Could the same flexibility be achieved with Super7 Operations? 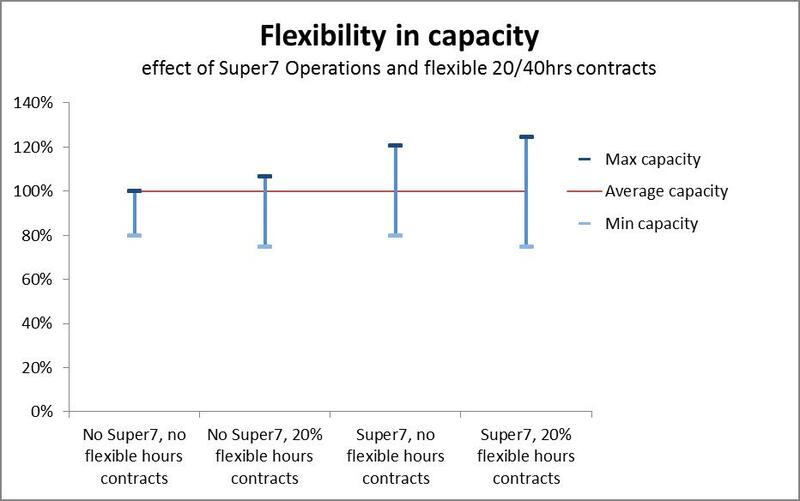 Next to this, our analysis showed that Super7 Operations delivers greater flexibility than replacing 20% of your people with min-max contractors. Naturally, things like team meetings and training are done on quiet days, and when they are planed on busy days they are rescheduled. This results in up to 20% lower ‘availability for productive work’ on quiet days – but this can be achieved without Super7 as well (we’ll call this scenario 1). To be complete, we added a fourth scenario: Super7 Operations and replacing 20% of the employees with min-max contracts. The graph below shows these four scenario’s next to each other. Surprising results, don’t you think? This entry was posted in Lean, Operational Management, Teamwork & cooperative models and tagged Book on Super7, flexibility, fluctuating demand, Lean, Super7, Super7 Operations on March 17, 2014 by M.R. van Dijk. You can make improving into a habit by practicing the improvement kata and the coaching kata over and over again. Kata (かた) is a ‘style’ of martial arts, aimed at perfect execution of the movements through repeated practicing (“paint the fence, Daniel-San”). By practicing often the routine becomes a habit – you can do it without having to think about it. Learning to drive a car is also an example of this principle: at first, you really need to think about what you doing, and after a while you do it thoughtlessly. More on Super7 Operations can be found in my book: Super7 Operations – The Next Step for Lean in Financial Services. This entry was posted in Kata Coaching, Lean, Teamwork & cooperative models and tagged Coaching Kata, continuous improvement, Improvement kata, Kata, learning organisation, Super7 on March 10, 2014 by M.R. van Dijk.